Our riding association passed a resolution in January calling for the implementation of a basic income guarantee. It is clear that addressing the needs of precarious workers calls for a new approach. Basic income is ethical, economical, and equitable, and would enable us to truly move forward together. Precarious work is the definitive economic challenge facing our generation. The NDP is taking the lead in understanding this issue and seeking bold solutions. Please consider signing this E-petition started by Safe Rails Communities! Our former candidate Phil Trotter and the Etobicoke-Lakeshore NDP promoted their campaign and cause during the federal election. Our former candidate representing residents in Etobicoke-Lakeshore. The true measure of the strength of a nation rests in the kindness and generosity with which its citizens treat one another. We are proud to stand with our fellow Canadians as a voice for kindness and compassion. Tomorrow, February 24th, we encourage our supporters and all Canadians to wear pink shirts in support of one another, presenting a united front against bullying and taking a stand for kindness. We are all in this together. "[M]anage fiscal consolidation to promote rather than reduce prospects for growth and employment. It should be applied in a socially responsible manner." - The IMF, the World Bank, and the WTO, 2014. Austerity was never the right path forward. We've known this for a long time - and the data has been very clear. Austerity is an experiment that has failed. Though the Senate gutted this bill last time, we have re-introduced this urgently needed legislation and will never rest in our pursuit of human rights. Thank you so much to all of our many volunteers, donors, voters, and supporters. This was a long election, and you were there day after day working hard on our behalf. Thanks as well to our incredibly hard-working and genuinely compassionate candidate, Phil Trotter, NDP. Our whole team has the utmost respect for you, and it was an honour - and fun! - to campaign alongside you. We worked hard, and we learned a lot. 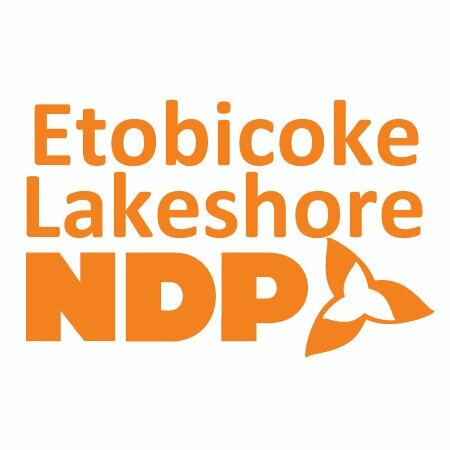 Building on the firm foundations laid down here by previous generations of NDPers in Etobicoke-Lakeshore, and working together with friends and neighbours across the riding and of every age, culture, and creed, we've continued to strengthen and develop our organization. By every metric, this was the strongest NDP campaign the riding has seen in years. And we are just getting started. Take heart, friends. The best is yet to come. We're working to build a better world - and we will not be denied. "I'll take consistent compassion over calculated compassion"
Not sure what you need to vote? Here's the list! Still have questions? Call our campaign office - 647-346-1955 and we'll help you out. Today's the day - Stephen Harper's LAST DAY! Join Tom Mulcair, Joel Plaskett, your ELNDP team, and thousands of New Democrats for one last rally before the big day! Click the link to RSVP. We'll see you there! With the Conservatives at the end of their rope and the Liberals facing - surprise! - a scandal over their cozy relationship with lobbyists in the fossil fuel industry that is literally destroying our planet, people are returning to the party that has consistently stood up to Steven Harper on behalf of Canadians. And if you compare today's polling chart with the one from 2011, you may notice some intriguing similarities. It's not over yet. Don't let them tell you it can't be done. Harper and Bill C-51 represent a real threat to Canada. Fear is powerful - but hope is stronger. We have always stood up for Canadians; we have always stood strong against fear. And we will always will. On October 19th, the real vote is a vote against fear. Vote NDP. This great in-depth interview with Megan Leslie underscores the connection between dealing with climate change and delivering social justice - and the NDP's commitment to both. There is a better way in Etobicoke-Lakeshore. Last election, Stephen Harper won 39% of the vote, but 100% of the power. The NDP is committed to never letting that happen again. We have firmly endorsed mixed-member proportional representation, which was recommended by the Law Commission of Canada (after a 2 year process and 17 public consultations) and 9 out of 10 provincial commissions. Let's make democracy work. Vote NDP for real democracy and genuine change! An NDP government would a strong advocate for science and evidence-based decision making. Check out our science platform! Look for orange tomorrow morning! We'll be out with reading material for your morning commute, letting the residents of Etobicoke-Lakeshore know about Phil Trotter, NDP's plan to improve transit accessibility and coverage. See you at the station! We've delivered a fully-costed economic plan for Canada that doesn't transfer wealth to banks through deficit spending and realigns our spending priorities with the things that matter most to Canadians. We're ready for change. Globe & Mail Leaders Debate Viewing Party! We're building a riding association that can deliver real progress right here in the heart of Etobicoke. Phil's campaign is already the strongest we've seen in decades - and it's only growing. From time to time, we do need to ask for money to help get the job done. Even just 10, or 5, or even just a single dollar helps us achieve our goals. Donating at the link below goes directly to your LOCAL riding association and stays right here in Etobicoke-Lakeshore to help us continue to build. With your help, we WILL turn this riding orange. Be a part of the change we need - don't let them tell you it can't be done! Orange signs are going up all over the riding as support continues to grow for our candidate, Phil Trotter, NDP. Have you taken yours yet? Click here to show your orange pride! The NDP has a solid, thoughtful, and compassionate plan for assisting displaced Syrians to reach and successfully settle in Canada. Read our latest blog entry at the link below to get the details! Phil Trotter Campaign Office Grand Opening and Volunteer Faire! Correcting the record: Tom Mulcair isn't "pulling out" of the "Up For Debate" event. Get the facts in our latest blog post. Join Tom Mulcair at the Rally for Change in Mississauga! Wear orange and show your support for Phil Trotter, NDP at tomorrow's All Candidates Meeting! Time for a change! Vote #NDP and Phil Trotter, NDP here in Etobicoke-Lakeshore!